You will need Node and npm installed on your machine. A basic understanding of Angular, TypeScript and Ionic will be helpful. A geo-fence is a virtual perimeter for a real-world geographic area. 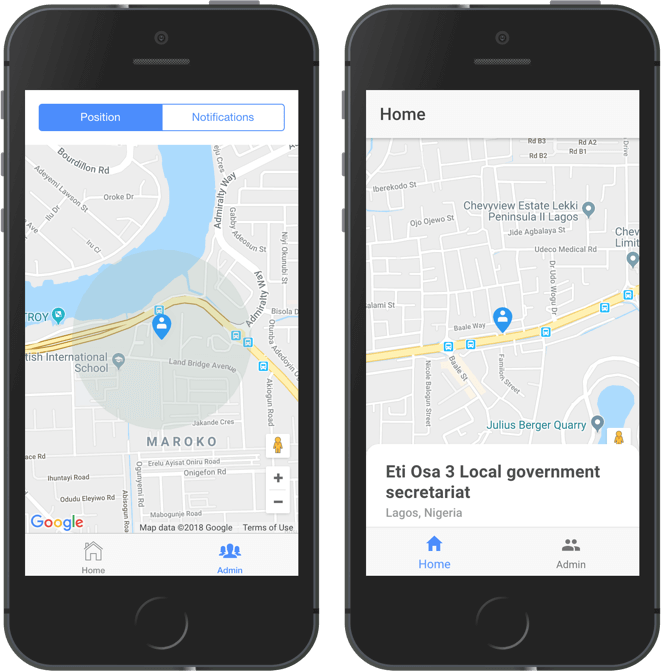 Geofencing is the use of GPS or RFID technology to create a virtual geographic boundary, enabling software to trigger a response when a mobile device enters or leaves a particular area. Using Ionic, you can create a mobile application using web technologies and use a wide array of existing components. Using Pusher, we can enable realtime functionalities in the application using Pusher’s pub/sub pattern. To follow this tutorial a basic understanding of Angular, Ionic and Node.js is required. Please ensure that you have Node and npm installed before you begin. We’ll be sending messages to the server and using Pusher’s pub/sub pattern, we’ll listen to and receive messages in realtime. To make use of Pusher you’ll have to create an account here. We’ll initialize our project using the Ionic CLI (command line interface). First, install the CLI by running npm install -g ionic in your terminal. NPM is a package manager used for installing packages. It will be available on your PC if you have Node installed. The command uses the CLI to create a new project using the tabs template. 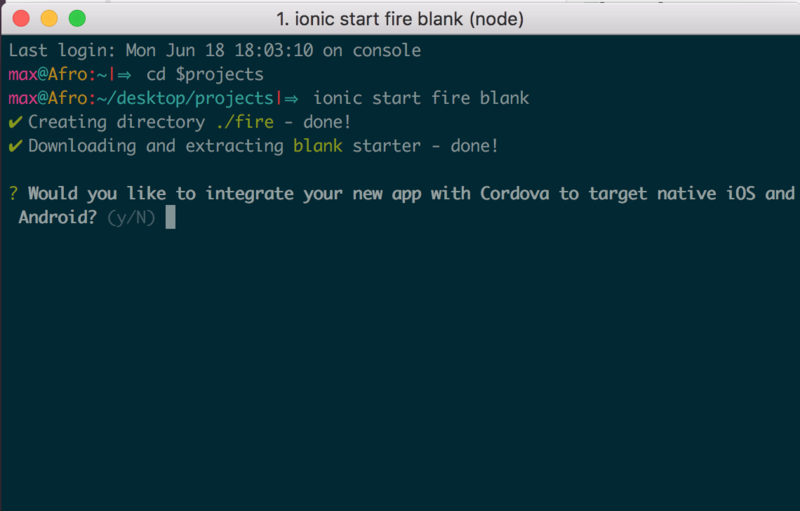 Follow the prompt and integrate your app with Cordova to target IOS and Android. Type Y to integrate Cordova into the application. The next prompt will ask if you want to integrate Ionic pro into the application. If you have an Ionic pro account, type Y and N if you don’t. The Ionic team provides three ready made starter templates. You can check out the rest of the templates here. Open a terminal inside the project folder and start the application by running ionic serve. A browser window should pop up and you should see screenshot below. Next, run the following commands in the root folder of the project to install dependencies. Now that we have our application running, let’s build out our server. To do this we’ll make user of Express. Express is a fast, unopinionated, minimalist web framework for Node.js. We’ll use this to receive requests from our Angular application. We referenced three packages in the snippet above, body-parser, pusher and dotenv. Let’s get into what each one does. dotenv is a zero-dependency module that loads environment variables from a .env file into [process.env](https://nodejs.org/docs/latest/api/process.html#process_process_env). This package is used so sensitive information like the appId and secret aren’t added to our codebase directly. The dotenv package should always be initialized very early in the application at the top of the file. This is because we need the environment variables available throughout the application. Also, you’ll notice that we installed Pusher library as a dependency. Visit the Pusher website to create a Pusher account if you haven’t done so already. Create a .env file to load the variables we’ll be needing into the Node environment. The file should be in the root folder of your project. Open the file and update it with the code below. P.S: Please ensure you replace the placeholder values above with your Pusher appId, key, secret and cluster. To enable users send in their current receive messages, we’ll create a route to handle incoming requests. Update your server.js file with the code below. We created a POST /ping route which, when hit, triggers a Pusher event. We used object destructuring to get the body of the request, we also got the lat and lng in the request body sent by the user. The data object will contain the lat and lat sent by the user. The trigger is achieved using the trigger method which takes the trigger identifier(location), an event name (ping) and a payload(data). The payload can be any value, but in this case, we have a JS object. The response will contain the data object. We’ll need another route to notify admin users when a user leaves their defined geofence. Let’s create a POST /notify route to handle incoming updates on the user’s geofence status. Update the server.js file to include the new route. Let’s build out the home page for our application. We’ll be creating two pages for this project, the home page and the admin page. Typically, the admin page would have been a separate application but in this context, we’ll limit it to just a page on this project. We’ll be updating the user’s location in realtime and also sending live location data of the user to the server. For this we’ll be using the native Geolocation API by ionic. The API will watch the user’s current position and update the marker on the map. First, we'll install the Geolocation plugin. Run the following commands to add the plugin to your project. ionic cordova plugin add cordova-plugin-geolocation --variable GEOLOCATION_USAGE_DESCRIPTION="To locate you"
In the snippet above, we added a new method to the HomePage component. The reverseGeocode method uses the Google Maps Geocoder API to reverse geocode coordinates to addresses. In the function we split the formatted_address property getting the short_name, state and country. The ngOnInit lifecycle got an update. First we reverse geocoded the current address after the Google Maps script has been loaded. We then check if the platform is Cordova supported. If it is, we initialize the geolocation API to watch the user's location, subscribing to the watch variable initiates the process. When the user's location is returned, we reverse geocode the coordinates to get the address, then we send the coordinates to the server. After this update, you should get an error that the Geolocation and HttpClient providers haven't been registered. To clear this error, we'll register the these providers in the app.module.ts file. Open the file and add them to the list of providers. 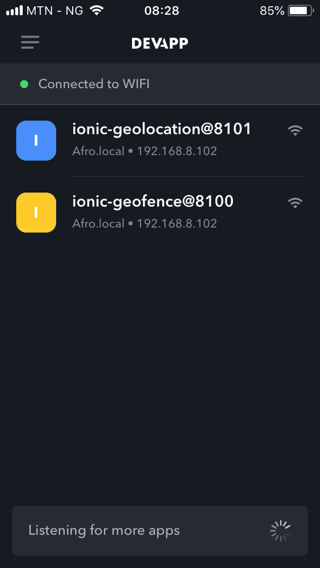 To set up geofences for the user, we'll make use of the native Geofence Ionic API. Install this plugin by running the following commands in a terminal in the root folder of your project. Each type is represented by accordingly by the numbers 1, 2 and 3. Next, we call the addOrUpdate method of the geofence provider, the method takes in the fence object we created. We'll be listening for the transition type of leave, which means we should get notified when the user leaves the set geofence. Updating the ngOnInit lifecycle to call the createGeofence method ensures that the geofence is created once the component is initialized. Include the Geofence provider in the module file to prevent the app from throwing errors. Add the Geofence to the list of providers in the app.module.ts file. We referenced an uncreated map component in the home.html file. Create a components folder in the src directory. Within it, create a map folder with three files in it. map.ts, map.html and map.scss. For the map component, we'll be using components provided by the angular-google-maps library. Let's register the angular-google-maps module and the new map component in the app.module.ts file. Open the app.module.ts file and update the imports and declarations properties. That's it. Pretty straightforward. Let's define the missing variables for the map component in the map.ts file. * Generated class for the MapComponent component. The map component will feature two inputs, center and zoom. The center input will set the center of the map and the zoom will do the same. Pretty self-explanatory. The radiusCenter will be used to define the circle drawn on the map, displaying the geofence set up. Below is a screenshot of the home page after all the changes made. So far we have an application that allows users to send location data but the location isn’t updated in realtime. To solve this problem, we’ll include the Pusher library. Let’s create a Pusher service to be used application wide. The Angular CLI can aid in the service creation. Open a terminal in your project’s root folder and run the following command. The init method returns the Pusher property we created. Note: Ensure you replace the PUSHER_KEY and PUSHER_CLUSTER string with your actual Pusher credentials. Style up the page by copying the following styles into the admin.scss file. The admin component will be displaying notifications in the notifications bar whenever a user leaves the set geofence. We’ll also have a notifications segment that will show a list of notifications over time. To display notifications in the notifications bar, we’ll be using the PhonegapLocalNotification native API. Install it as a plugin by running the following commands. In the ngOnInit lifecycle, we list for two events ping and exit from Pusher. In the ping event callback we use the data returned to update the current position of the marker. When the exit event is called we trigger a notification using the PhonegapLocalNotification. A notification object is created containing a reverse geocoded address and appended to the notifications array. After creating the admin page, the next step is to register it in the app.module.ts file and then add it to the tabs page. Update the app.module.ts file and the tabs page to include the admin page and the PhonegapLocalNotification provider. To test the application on your mobile device, download the IonicDevApp on your mobile device. Make sure your computer and your mobile device are connected to the same network. When you open the IonicDevApp, you should see Ionic apps running on your network listed. To view the application, click on it and you should see a similar view with what was on the browser. Sending messages to the server might have worked on the browser but localhost doesn’t exist on your phone, so we’ll need to create a proxy to be able to send messages from mobile. Copy the forwarding url with https and place it in the home.ts file that previously had http://localhost:4000/ping and http://localhost:4000/notify. Please do not copy mine from the screenshot above. Since our application is making use of some native APIs, we’ll need to test it on an emulator. To run our app on an emulator, run any of the following commands depending on the platform you’re building for. Following the instructions here for more detailed instructions on how to run your app on an emulator. To build your application to deploy on either the AppStore or PlayStore, follow the instructions found here. Using Ionic, Google Maps and Pusher, we’ve been able to create an application that offers realtime location tracking. We’ve also learnt how to create geofences using native APIs. You can view the source code for the demo here.